Reacting to Malakanyang spokesperson Harry Roque’s statement that labor groups could expect a pro-worker Executive Order on or before Labor Day, Partido Mangggagawa Chair avers, “it remains to be seen”. “Labor groups have gone through five drafts, and every draft was rejected by employers led by the Department of Trade and Industry (DTI) and the DOLE did nothing. Waiting for a pro-worker EO therefore that is agreeable to the employers is like waiting for a crow to change its color white”, Magtubo explained. “Only the President can issue a pro-worker EO if he wants to in order to realize his campaign promise. Now is the time that the President should show his political will by signing the labor-drafted EO”, he added. “Kaya ngang ipasara ng Pangulo ang Boracay para makahinga ang kalikasan. Bakit biglang nahihirapang maging decisive sa pangakong wakasan ang endo? Samantalang ang pro-worker EO ay reinstatement lang ng direct hiring na dati nang polisiya para maibasura ang nagkalat na porma ng kontraktwalisasyon sa bansa na sumisira sa buhay ng manggagawa,” said Magtubo. 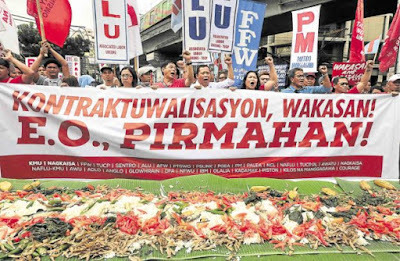 PM calls on all labor groups to close rank, stand firm on the position that labor will only accept a labor-drafted EO, and prepare for a nationwide “all labor” mass action on Labor Day.